The package "ttf-mscorefonts-installer" provides an installer for Microsoft TrueType core fonts in Ubuntu. 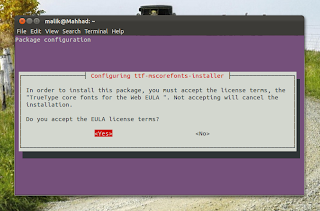 This package is installed automatically if you install the meta-package "ubuntu-restricted-extras". Many users face an issue when they are presented with End User License Agreement (EULA) in the Terminal and they don't know how to accept it, since clicks don't work in that dialog. This package might also cause issues if it isn't installed properly, mainly because it downloads the fonts from SourceForge and as we've experienced, SourceForge servers are almost always overloaded. As the result, the download of the fonts doesn't complete successfully and the package is left in an inconsistent state by the system. During the installation of this package, you are presented with a dialog like in the screenshot at the top (notice there, "<Ok>" is not selected by default). Unfortunately, you can't handle those dialogs with your mouse. So what you need to do now is: Make sure your Terminal window is focused by clicking anywhere in it, then press the <Tab> key to select the "<Ok>" button, then press <Enter>. Here you need to use the left arrow key to select "<Yes>", then again press <Enter>. Done! Now the installation of the package should finish, and if successful (fingers crossed! ), you don't need to do anything else. If the installation of "ttf-mscorefonts-installer" was not successful due to any reason, you might not be able to use your package manager, Ubuntu Software Center, Update Manager or Synaptic, etc. ; in short you won't be able to install, remove, or upgrade any packages until the issue is fixed! Hrrnnh!! There seems to be a programming error in aptdaemon, the software that allows you to install/remove software and to perform other package management related tasks. SystemError: E:I wasn't able to locate file for the ttf-mscorefonts-installer package. This might mean you need to manually fix this package. First, reboot your system to make sure "dpkg" is not locked (low-level package manager tool; see error above). 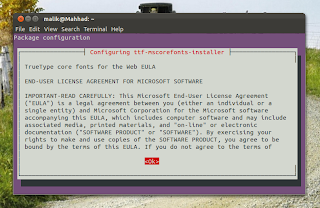 Now you should get the EULA dialog again, just follow the instructions in the section above to finish the installation.